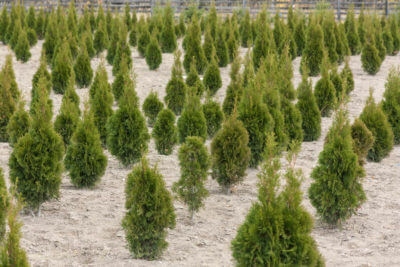 SEATTLE, WA: Big Trees Inc., (http://bigtreesupply.com/), a tree transplant and tree nursery company in the Seattle area, was recently involved in a project to enhance the privacy of a property in Mill Creek, Washington (in Puget Sound) with Emerald Green Arborvitaes trees. When Big Trees was asked to help establish privacy to the property in Mill Creek, luckily Big Trees had just the right larger privacy trees for their needs. After the client visited Big Trees’ nursery and became familiar with their inventory, they selected the Emerald Green Arborvitae for their situation. While these privacy trees are regularly used in screens through the western Washington area, it is unusual to find them in the larger sizes Big Trees offers. Once measurements of the screening effort were taken, it was determined that 13 of these trees were needed. The client felt that 12’-13’ tall Emeralds would be their choice for this project.